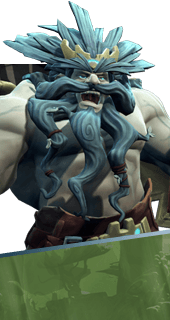 Boldur is a Hero in Battleborn. He is unlocked at Command Rank 26 or by completing The Experiment Story Missions. Boldur the Unbearable is a stubborn, axe-wielding native of Ekkunar who has survived the last two millenia of interruptions to his quiet forest life through sheer stubbornness and the aid of the civilian militia he leads called the Woodsworn. Tough as a gnarled root, the Ekkuni dwarf carries only a rune-forged axe and shield into battle against any foe who dares land their dropship in his front yard. Boldur leaps forward, dealing 141-213 damage and knocking back enemies. Rune Power: Dash causes an explosion on contact, dealing up to 534 damage. Throws Boldur's axe through multiple enemies, dealing 208-280 damage to each enemy. Rune Power: Axe explodes on impact, dealing up to 520-700 damage to nearby enemies. Killing an enemy with Axe Toss grants Boldur additional maximum health. Health bonuses reset on death. +50 Max Health per stack (Max 5).